-Beavers are the 2nd largest rodent in the world. 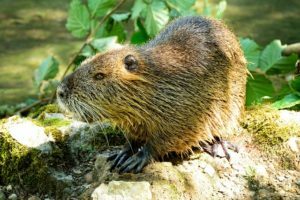 -When startled or frightened, a swimming beaver will quickly dive while at the same time slapping the water with its tail. This sound is audible over great distances both above and below water. -Beavers are slow on land, but are good swimmers, and can stay under water for as long as 15 minutes. -A beaver’s teeth grow continuously throughout its life; this is so they will not be worn down over time by chewing on wood. -Beavers continue to grow throughout their lives. Adult specimens weighing over 25 kg (55 lb) are not uncommon. – Beavers will live in a single dam with their whole family. This includes mom, dad, young kids, and baby beavers. -Beavers cause hundreds of millions of dollars in damages to properties every year in the United States. A: She needed to get to the udder-side. Q: Have you read any of the works written by Stanley Skunk? A: Don't. They really Stink! Interested in learning more Awesome Facts? Check out the links listed below; but remember to ALWAYS ask a Parent or Guardian first.